As well as the Global Quarantine, Each Email Security user has access to their own Personal Quarantine as well. Your Email Security account can have many different Quarantines, each with their own name and Rules. A Quarantine is only usable by users as a Personal Quarantine if the User Access flag is set to Yes. You can set or unset that flag in the Product Configuration screen. A Message Rule with a Final Action of Quarantine (as opposed to Quarantine - Company) will place a message in the user's Personal Quarantine. The user then has the choice of whether to Release, Deny, or Delete the email, just as with the Global Quarantine. The difference here of course is that the email's details will be added to the user's Personal Safe/Deny List, rather than the Global Safe/Deny List. 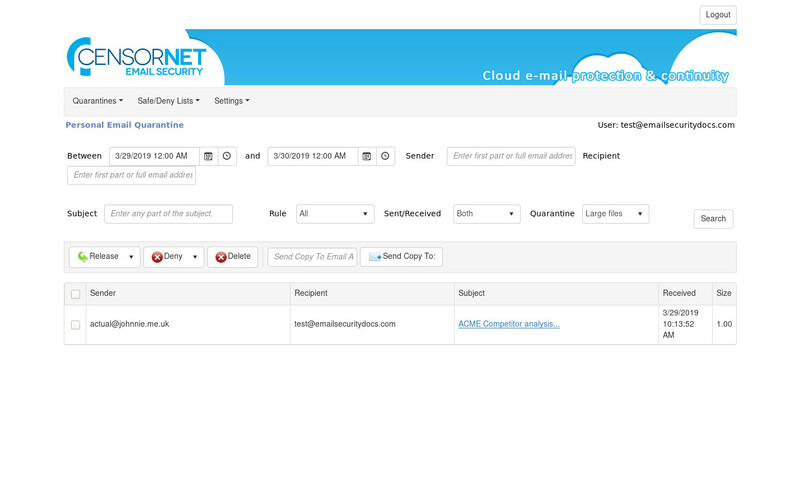 If you can't see an email that you know should be listed in the Personal Quarantine screen, make sure that you've selected the correct Quarantine from the Quarantine drop-down list.